Thanks for joining us for this year’s Thunder Run. We hope to see you next year! As a thank you for your participation in the Oklahoma City Thunder Thunder Run, each participant will receive complimentary Baseline Reserve ticket to the Oklahoma City Blue vs. the Canton Charge on Dec. 29. You will have the option to purchase additional tickets and or upgrade your tickets as well. The race will be held on Saturday, Dec. 29, 2018. The race will be held at Chesapeake Energy Arena and through downtown Oklahoma City. What is included in the registration after Dec. 5? 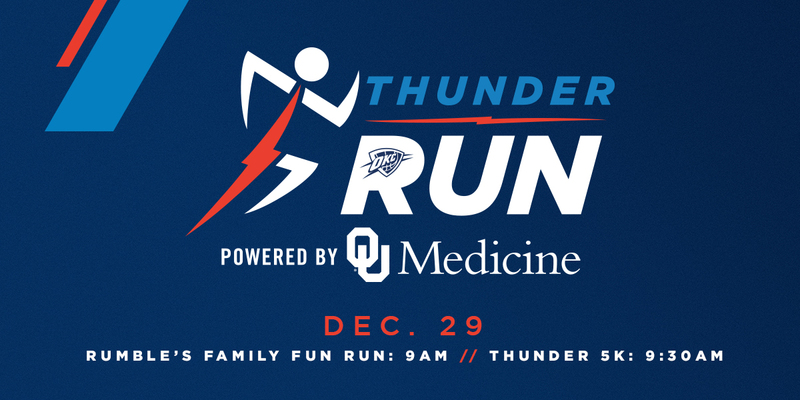 The Thunder Run 5K and Rumble’s Family Fun Run online registration is now closed; however, you can register in-person tomorrow, Dec. 29 starting at 7:30 a.m. at the NW Entrance at Chesapeake Energy Arena. Packet pickup is at the Thunder Shop located on the west side of the Chesapeake Energy Arena. You may pick up packets and Thunder swag bags for other participants as long as they have signed and submitted the waiver. Waivers may be signed at pick up. Thursday, Dec. 27: 10 a.m.- 5:30 p.m.
Friday, Dec. 28: 10 a.m. – 5:30 p.m.
What if I cannot make it to the packet pickup? Packets and Thunder swag bags will be available for pick up on the day of the race (Dec. 29) at the northwest entrance of the Chesapeake Energy Arena starting at 7:30 a.m. You may pick up packets and Thunder swag bags for other participants as long as they have signed and submitted the waiver. Waivers may be signed at pick up. The race is a sanctioned 5K route, which is approximately 3.1 miles. You may choose to walk or run either route. Rumble's Family Fun Run is one mile. Click here for tips from OU Medicine to help you successfully prepare for race day. Oklahoma City provides many parking possibilities around the course. Head to www.parkingokc.com to see the many garages and pricing options available on the day of the race. We encourage all spectators to watch participants cross the finish line inside the Chesapeake Energy Arena. Doors for the finish line viewing will open at 9 a.m. at the NW entrance. All cameras (including digital, professional and detachable lenses) are allowed. Laser pointers are not allowed. How will we be notified in the event of bad weather? In the event we experience inclement weather on the day of the race, any and all updates regarding the race will be sent to the email addressed provided at registration. There will be no refunds or exchanges for this event. Is there an age requirement for OKC Blue Tickets? For Oklahoma City Blue games, children ages two and below do not require a game ticket; ages three and up (this includes children needing a seat) require a game ticket to enter the Cox Convention Center. What if I have children under the age of eight who would like to participate in the Thunder 5K? Registration for the 5K is required for children eight and older. Children who want to participate in the 5K but have not reached their eighth birthday may participate without registration, but will not receive a bib, goodie bag, long-sleeve T-shirt and ticket to the Oklahoma City Blue game on Dec. 29. 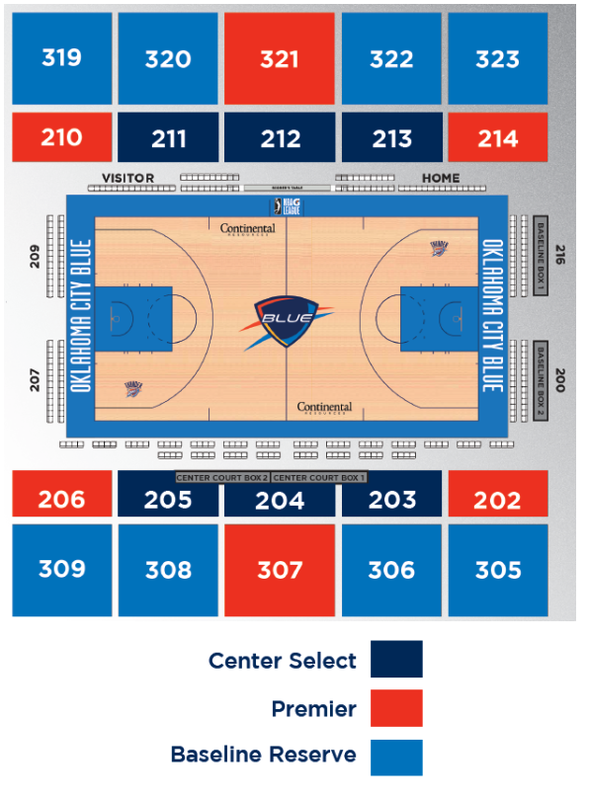 Additional Oklahoma City Blue tickets can be purchased starting at $10 per person. All participants must sign a release form/waiver in order to participate in the Thunder Run as part of online registration. Parent/guardian will sign it online for anyone under the age of 18 years old. Waivers will be emailed to those registered by others online and should be submitted electronically. Waivers may be physically signed at packet pickup. Yes, you may bring a stroller. However, those pushing a stroller will have a separate starting point. Strollers are allowed but are encouraged to start behind the runner and walkers. Pets are not allowed unless they are certified service/emotional support animals.